New Fortified Passive, Sniper buffs, Wingman nerf, and more! Version 1.1.1 of Apex Legends, the second update since the release of Season 1, arrived on 16th April, bringing with it a number of major weapon and ability balance changes – particularly to Gibraltar and Caustic as well as the sniper rifles class as a whole. Our Apex Legends patch notes and update guide will walk you through everything new that has arrived with this new update; and we’ll also go over all of the previous patch notes and changes that we’ve seen since the game’s release. 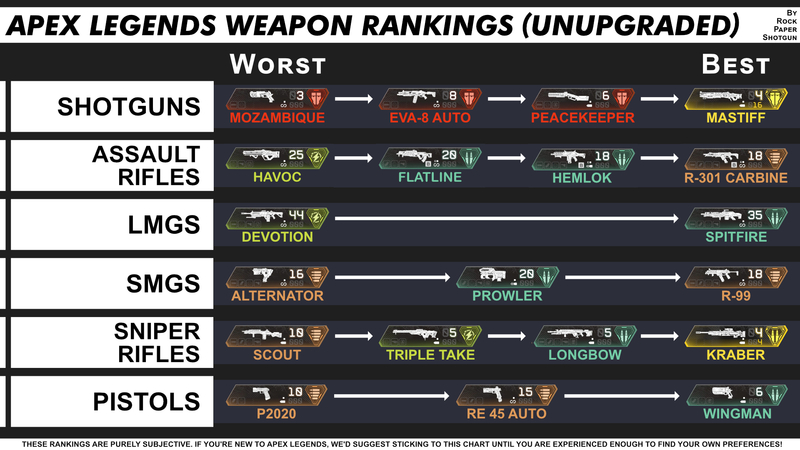 This patch notes guide is but one small section of our massive Apex Legends tips/guide series, which now features over 50 individual guides on everything from the various Apex Legends characters to stats on each of the Apex Legends guns/weapons and types of Apex Legends loot on offer across King’s Canyon. We’ve got a lot to cover here with all the changes and features introduced with the release of v1.1.1 of Apex Legends. Click on any of the links below to be brought straight to the sections of Apex Legends patch notes that interest you. Click on the below box to expand it and reveal the full patch notes for everything that has been added with the arrival of Apex Legends v1.1.1. Once you’ve had a read, take a look below for our thoughts and opinions on these changes. In honor of Thicc-boi buffs, we’re going to be running a bonus Battle Pass XP event. From approximately 10AM PST 4/16 through approximately 10AM PST 4/18, your first Top 5 of the day (your squad places 5th or better in a match) will grant you 1 full bonus Battle Pass Level (29,500 BPP), up to a max of level 110. You can earn this once per day. We’ll also be finding other moments during the season to add Battle Pass XP bonuses, so stay tuned! We felt that the ship was moving a bit too slow after watching player behavior so we’re speeding it up so players that like to drop later in the flight path don’t have to wait so long. Fixed UI bug where the wrong percentage would be displayed for all boost badges. Good? Good. Now let’s dive into some of the major features of this massive balance update. The biggest news with this update is, of course, Respawn’s newest and most meaningful attempt to address the large hitboxes and low viability of Gibraltar and Caustic. With the advent of Season 1 they slightly reduced the hitboxes of these characters (and Pathfinder) to better match their character models, but this was nowhere near enough to see them rivalling the likes of Wraith, Pathfinder, Lifeline, and Octane in terms of play rate and success rate. But now, both Legends have been given an extra Passive ability (alongside their existing Passives) called “Fortified”, which reduces all incoming damage by 10%. This was one of the most popular ideas thrown about the Apex Legends subreddit since the news of their increased hitbox sizes was revealed, and it makes perfect sense. Now there are two ways to deal with damage: avoid it, like Wraith or Octane, or absorb it, like Gibraltar and Caustic are now able to do. In addition to this, Gibraltar’s Gun Shield now absorbs 75 Health before subsiding instead of 50, and Caustic’s Nox Gas starts at 4 damage per tick instead of 1 – both significant buffs to key abilities in the characters’ skillsets. Time will tell if these changes are enough to cause a long-lasting shift in the Apex Legends meta for character selection, but it looks like a very strong step in the right direction so far. Two top-tier weapons have been nerfed with the 1.1.1 update: the punchy hit-your-shots Wingman, and the bullets-for-days Spitfire. With the Wingman, it appears that the February nerf it received alongside the Peacekeeper still wasn’t enough in Respawn’s eyes to bring the gun in line with the rest of the Apex Legends weapons arsenal, and so now they’ve drastically cut the magazine size of the gun from 6/8/9/12 to 4/6/8/10. That means you need to really hit your shots now with the Wingman, and the decision to take a Wingman over the now-buffed Scout or Longbow (more on this in a moment) is not nearly as clear-cut as it used to be. With the Spitfire, the LMG’s base damage has been reduced from 20 to 18, putting it only just ahead of the Devotion in terms of flat damage per shot (and quite a ways below in terms of overall DPS). Of course, it still packs a hell of a punch with its high damage and rate of fire (and bullets for days) – though Respawn have also lowered the extra magazine capacity provided by the various tiers of magazine attachments, so now the mag sizes are 35/40/45/55 rather than the 35/45/55/60 they used to be. It’ll still be a top-tier weapon (as is Respawn’s plan for the Spitfire), but I’d now say if you have a Turbocharger then the Devotion should be your go-to LMG every time. Since release, Apex Legends has always been a very close-quarters game when it comes to firefights, thanks to the ease with which you can close distances and the speed with which you can heal if hit from afar. Respawn have finally addressed this issue in a patch which brings some minor buffs to the sniper class as a whole, and some massive buffs to the Longbow in particular. Regarding the minor changes: all snipers (minus the Kraber) now enjoy a greatly reduced amount of weapon sway, allowing you to land those long-distance shots more easily (and incidentally lowering the usefulness of a Stock attachment to nearly nothing). The Scout, Triple Take, and Longbow have also received an increase to leg shot damage, giving you that extra bit of incentive to go for long-range shots. But the Longbow DMR received the lion’s share for this update, with a dramatic rate of fire increase from 1.2 to 1.6, and an increased magazine size across the board, from 5/6/8/10 to 6/8/10/12. The latter is very much a result of the former fire rate increase, which incidentally reduces what was previously the Longbow’s biggest downside. Now you can pop players from great distances (thanks to the general sniper class buffs above) for 55 damage every 0.625 seconds. It’s an excellent buff for a previously outclassed weapon, and we might finally start seeing Longbows making their way to the final circles now. Good news for you sharpshooters out there. The last major weapon change relates to the Havoc, which has received a number of buffs, mostly concentrated on its unfortunately very underwhelming Selectfire Receiver-enabled single-shot beam mode. The trouble is that it’s just not great to use. The beam takes a large amount of Energy Ammo to fire with each shot, and the pleasantness of its hitscan abilities is completely ruined by the charge-up time between shots. Now, the overall damage of the beam has been increased thanks to a series of buffs to the damage dropoff of the weapon, and the ammo requirement per shot has been reduced from 5 to 4. Personally, I’m still never going to use the Selectfire Receiver over a Turbocharger for the Havoc, and this is something that Respawn themselves also seem to acknowledge, because in these same patch notes they’re also changing the fully-kitted gold variant of the Havoc to sport a Turbocharger rather than a Selectfire Receiver. So despite the changes being a step in the right direction, I still think the unique beam shot mode is unfortunately rather lacklustre. On the bright side, the Havoc received a massive increase to its magazine size, from 25 to 32 – which makes perfect sense after you read Respawn’s own notes, which explain that while rival Assault Rifles like the Carbine are meant to be less dependent on ammo but requiring more focus on attachments to fulfil their potential, the Havoc is meant to require a great deal of Energy Ammo but in return gives you a great weapon without as much need for the attachments. Now, I don’t quite agree with that, because the high recoil of the Havoc (and lack of Barrel attachment slot to mitigate it) is a huge downside with this weapon; and I’d never choose a Havoc over any other Assault Rifle unless I already have a Turbocharger for it. But even so, those who liked the Havoc before are going to be very pleased with these new changes. Below we’ll be adding the full patch notes for every update since the release of Apex Legends. Simply expand the box of whichever update takes your interest to peruse everything that arrived with that patch. If it doesn’t involve diving, leaping, plummeting, or racing, then Octane wants nothing to do with it. Always the life of the party, Octane truly believes winning the Championship isn’t enough… not if you didn’t cheat death at least twice to get there. We’ve got some fixes in this patch that will improve stability on PC but we know there are still issues out there we need to address. We also added crash reporting so we can better understand how to tackle the issues we haven’t solved yet and address future ones. And that’s pretty much everything for now! Hopefully you’ve emerged with a greater understanding of the changes that have been introduced with this new Apex Legends update. Keep checking back here for all the latest thoughts and facts about the current state of Respawn’s exceptional battle royale. Tagged with feature, guides, Respawn Entertainment, Apex Legends.